Allowing users to enter information, whether to place an order, enquire about something on the site or for many other reasons is fundamental to web applications and sites often contain many such forms. In this lesson we learn how to create HTML forms, interrogate field values passed back to our servlets from HTML forms and how to action an appropriate response to form input. It is not an intention of this lesson to validate form input or persist form information as we will be covering these subjects in later lessons. If you need to brush up on the various elements contained within HTML forms there are several lessons and references covering these in the HTML 4.01 section of the site. The rest of the lesson assumes you are comfortable with HTML form elements and so we will not be discussing these in any great detail. What we do need to know are the values passed from elements within a HTML form to our servlets when the user submits the form and we will be discussing this shortly. The first thing we need to do when using HTML forms is to send the HTML form to the user for data input and this is easily achieved by placing the HTML form construction code within the doGet() method. This way when the user requests the resource we can present them with a HTML form for data entry. After user entry we can then process the HTML form using the doPost() method. This is achieved, using a form of the syntax below the next paragraph, within the HTML form sent to the user via the doGet() method. Using the doPost() method for validation of user entry means we can separate our coding into both methods rather than having everything in the doGet() method which makes for cleaner code. The added benefit of using the doPost() method is that information from the HTML form gets submitted in the request body thus ensuring that any sensitive information is not visible in the passed URL. The action attribute can be left out or an empty string. Omitting this attribute or putting action="" will send the submitted form to the same URL used for the request. If a path is specified in the action attribute, this can point to either a static or dynamic resource. The method attribute is optional and will default to get, can be in upper or lower case and must be a valid HTTP method. If the method attribute is left out then your servlet must contain a doGet() method or you will get an exception. Knowing what is passed to our servlets on submission, when a user has interacted with particular HTML form elements, is vital to coding our user responses and we will talk about this before we code our first HTML form. Values entered within a HTML form are sent to the server as request parameters which we can retrieve using methods of the ServletRequest object. The following table lists the various HTML form elements we can interact with and how we can get to their values using ServletRequest methods. input (checkbox) getParameter(name) If a checkbox is checked then "on" is sent to the server. If a checkbox is unchecked then nothing is sent to the server and method returns null. password/textarea) getParameter(name) The value of the input field is sent to the server. If the input field is empty then an empty string is sent to the server. input (radio button) getParameter(name) If a radio button is selected then the value of that button is sent to the server. If a radio button is not selected then nothing is sent to the server and method returns null. getParameterValues(name) All values are sent to the server as an array of String objects. This method will retrieve the last one on the form. This method will retrieve all of them. select (single value) getParameter(name) If an option is selected then the value of that option is sent to the server. If no options are selected then the displayed option is sent to the server. select (multi value) getParameterValues(name) If multiple options are selected then the value of these options are sent to the server as an array of String objects. If no options are selected then nothing is sent to the server and method returns null. 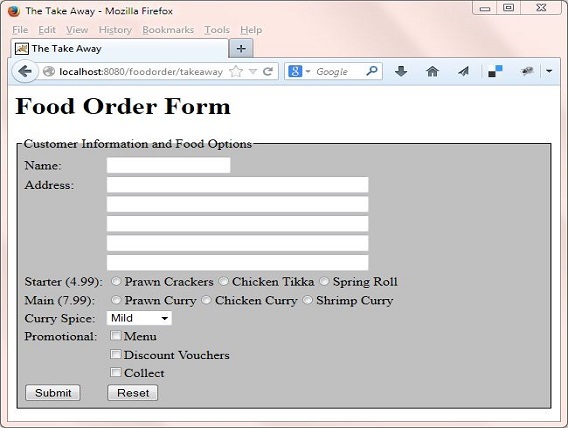 What we are going to do for our first servlet that uses a HTML form is create a very basic form for ordering a take away. 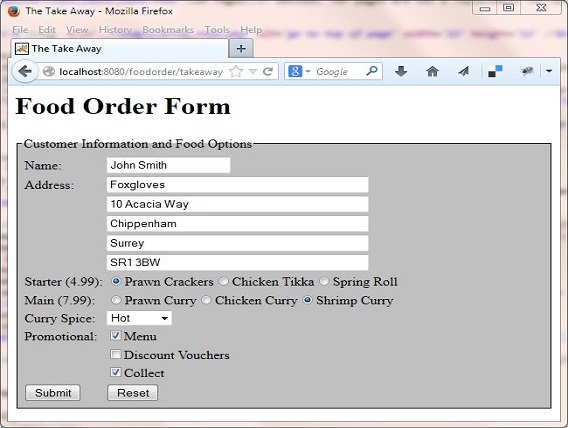 When the servlet is first actioned we will present the user with a form where they enter their name, address, meal selection and delivery method. When the submit button is pressed we will display some information pertaining to user entry. The first thing we are going to do in our setup is to make a base folder called _ServletsInt in the root directory of our hard drive which we can put all web applications for this section into. click the Folder option and call the folder _ServletsInt and press enter. Within the foodorder folder we will create separate folders to hold our DD, source files and our compiled byte code and these will be called dd, src and classes. We don't need view and lib folders for the early web applications and so we won't bother creating these until we need them. Within the src folder create a subfolder called controller, we don't need a model folder for the web applications in this section. Cut and paste the following code into your text editor and save it in the c:\_ServletsInt\foodorder\src\controller directory as FoodOrderServlet.java. As you can see from the code writing even basic servlets requires a lot of writer.print() statements to enclose our HTML which can be a very laborious process. We will see how we can write code like this much more elegantly when we look at the JSP Pages section. JSP pages are not a replacement for servlets however and they can be thought of more as complementing the processing we do in servlets. Compile FoodOrderServlet.java using the java compiler with the -cp and -d options as below, making sure you change apache-tomcat-6.0.37 to wherever you downloaded Tomcat to. The following screenshot shows that we get a clean compile and also the FoodOrderServlet class now compiled into the classes\controller directory. There are no DD entries for this application that we haven't seen before. Save the web.xml file in the DD folder. 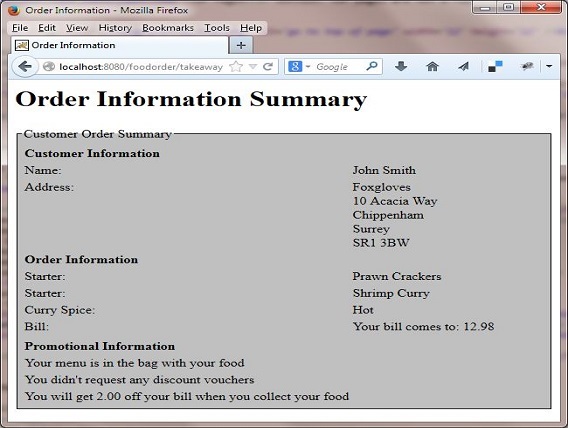 Within the foodorder folder create the WEB-INF folder. Copy the web.xml file and the classes directory and contents from our development environment into the WEB-INF folder. Open a command prompt and change the directory to the location of our Tomcat 6 bin directory and then type in startup (Windows 7) or startup.sh (Linux/Unix/OSX). Press Enter and the Tomcat 6 server should open up in a new window. You can also start up Tomcat by double-clicking the startup batch file within your Tomcat /bin folder. As you can see the response from the doGet() method has returned a form for a user to fill in. In this lesson we learnt how to create HTML forms, how to extract information from them and the rules about what gets passed from the form. In the next lesson we start the first of three tutorials on session management. All the Servlets 2.5 lessons are listed below. Click a link to go to that lesson.